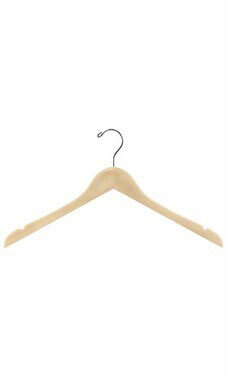 Our dress hangers are our most popular hanger sold. It's the staple of any merchandise display. The 17" Natural Wood Dress Hangers are an obvious and simplistic way to instill a modern vibe to your showroom. The raw color and smooth design of these wooden hangers will undoubtedly enhance the apparel on your racks! Complete with silver metal hooks to provide extra strength and durability, these wooden dress hangers are a perfect solution to your retail display. Sold in cases of 50.